Michael McCloud '85 believes in Sigma Nu. He will even go so far as to say that being involved with Sigma Nu was one of the biggest milestones of his life. But Mike goes beyond just saying he supports our fraternity; he puts his money—and his time—behind his words. Mike's not crazy about getting public credit for what he's done, but his active support of our chapter kept the house intact in the last decade, paving the way for our current revitalization. Mike gives Sigma Nu the highest possible compliment: he credits the fraternity for his success. "My experiences with the fraternity were more important (to my life) than school—more of an education," Mike says. "You learn how to get things done and work with 60 other people, who just happen to be your best friends...The confidence that gives you is invaluable. It transfers outside of the fraternity...and ultimately to life." After graduating in 1985, Mike stayed involved with the chapter because he thought it was important to give back to the organization that had played such a defining role in his life. He acted as an unofficial chapter advisor and became the house corporation president in the early 1990s after Pat McKenna pleaded with him to take over. So it was Mike that the Atlanta Olympic Committee approached when Georgia Tech was chosen to serve as Olympic Village for the 1996 Olympics in Atlanta. The Sigma Nu house would have to be brought up to code in order to house the athletes, he was told, and it was a long way from meeting codes. "I suggested that we could just close down the house (during the Olympics)," Mike said. "But the AOC said they'd simply have it condemned." There was no alternative but to do a quick renovation. Frank Spears and Mike quickly put together a plan that would keep the house from being condemned and taken away from the fraternity. "It wasn't a great job, we had two years to raise the money and complete the renovation" he says now of the work done on the house. "But we survived." Mike gives current House Corporation President Gary Jones '71 credit for the forward momentum the chapter is now experiencing. "Gary came in and started everything over." And Mike is happy to support those efforts, both financially and philosophically. "I owe my success to my fraternity experience," he says in explaining why he is supporting the capital campaign. "It is important to me that we provide that same chance to other young men." Mike thinks his initial involvement with Sigma Nu was pretty typical. He joined because he had a lot in common with the other men of the house, and he knew a couple of brothers, including Bruce Wheeler and Steve Stansel He enjoyed the typical activities: football games and band parties at the house. "The fraternity was a great place to commiserate with others about school and a great place to get help," he says. "It was the center of our social life...a way to deal with the stresses of school." Mike's fondest memories include constant antics from Mark Fouraker (Grandpa – because he reminded his brothers of Grandpa from the Munsters), bailing Scott Little out of jail after he led campus police in a high speed chase around campus, and taking Rollo, the fraternity dog, to class with him. Mike's first year in the house was in the Mike Room, so named because he shared it with Mike Gross and Mike Flagg. He still keeps in touch with the other two Mikes. He then moved into the Mom's Room—the former house mother's room—where he stayed until graduation. He shared that room with Tom Carney and Don Gee, and later, Greg Davidson. Mike's wife, Terri, of 20 years was roommates with Tom Carney's girlfriend and Greg Davidson's girl friend. Tom and Mike were even officers together. Mike started his service to the chapter his sophomore year, when he was pool commander. The following year, he was house treasurer, then commander his senior year. "The fraternity budget was something like $160,000, and we were responsible for it," he notes. "We had an employee, a mortgage...it was a big job and we had no experience, but we couldn't get fired for making a mistake! That responsibility pushes you to do things you might not have done otherwise." Proving himself at Sigma Nu also gave Mike the confidence and the desire to pursue other leadership opportunities. He served as the Inter-fraternity Council's treasurer and belonged to ANAK, Georgia Tech's secret society for juniors and seniors. He was also involved with FACET, which was the university's freshman orientation program. Always putting Sigma Nu first, Mike says, "It was fun and important to the school, but it also gave you exposure to the freshman, so it was a great tool for Rush." Mike credits his leadership activities at Sigma Nu for his first job, with Procter & Gamble. "P & G only interviewed people with leadership experience," he says. "They loved guys from fraternities because of all the experience it gave them....I wouldn't be where I am right now without Sigma Nu." Where he is right now is owner of Uptown Bakers, a commercial bakery in Hyattsville, Maryland that provides artisan breads and pastries to hotels and restaurants throughout the Baltimore and Washington, DC region. Mike decided long ago that he wanted to be the CEO of a Fortune 500 company. He was well on his way to that goal 10 years ago when fate stepped in: just as he took the job as president of Vie de France in Washington, DC, his wife, Terri, was diagnosed with breast cancer. "She was 34; we had a two-year-old, and we were just in the process of moving," Mike recalls. His wife decided to stay in Atlanta for treatment, which allowed for Mike and Terri's parents to help look after their son. But after a year, Mike decided he couldn't continue to work apart from his wife. "It was another milestone," Mike says. He was consulting with small businesses, helping them prepare to be sold or go public, when Uptown Bakers called asking for his help. A year later, in 2002, Mike bought the business. It's not what he envisioned himself doing, Mike says, "but priorities change." He's happy to report that his wife is now doing well. They will celebrate their 20th anniversary this August. Another milestone, all the more special because of what they've gone through to get there. Mike and Terri are supporters of the Susan G. Komen Breast Cancer Foundation and the Multiple Sclerosis Society. But Mike's real commitment is to Sigma Nu, and we're all better off because of it. Chester Stokes, Sigma Nu pledge class of 1962, is a successful real estate developer. Based in Jacksonville, Florida, he also has offices in Tampa, Atlanta, Raleigh, Charlotte and Charleston. He is a man of both significant means and significant responsibilities. And he has recently agreed to serve as one of three co-chairs for Sigma Nu's upcoming capital campaign, making substantial commitments of both time and money. He's willing to do it for one simple reason: his friends. "The fraternity was a big part of my early life," he says. "I made a lot of friends that I keep in close contact with, who've been important in my life. I've always been of a mind to give back, and I'm fortunate to be in the position to do so. The fraternity has been good to me." Chester joined the Gamma Alpha chapter during his sophomore year because he felt comfortable there. He lived in the house, rooming with several different brothers, including Jack Painer (now deceased), Peck Edwards and Phil Gingery (now a member of the U.S. House of Representatives and another of the capital campaign's co-chairs). The third co-chairman is Charlie Brady '55 of Atlanta, GA.
"Sigma Nu was just a close group of guys," Chester says. "If you ever needed help of any kind, you could always find it—whether it was for help studying or for someone to talk to about your girlfriend. I want future students to be able to have that kind of support." Chester stays in close touch with one particular Gamma Alpha brother. "Hawley Smith is my best friend in the world—other than my wife," Chester says. Hawley moved to Jacksonville in 1972 to go to work for Chester. The following year, Chester left that business to open Stokes & Company, his real estate developing company. Today, Chester is chairman of Stokes Land Group, and Hawley is president of H. Smith, Inc., also a real estate firm. Are they in competition? "There's enough land out there for everybody," Chester says with a laugh, adding that they tend to focus on different business. In addition to Stokes Land Group, Chester is also chairman of Island Foods and Grease Monkey Corporation. Chester and his friend and Sigma Nu brother, Hawley, own 9,000 acres of land together. They and their wives recently donated 500 acres to Seamark Ranch, a non-denominational Christian children's home for abused, neglected, abandoned, orphaned and homeless children. The property will be developed into a ranch which will house 100 children. Chester says that most of his civic and charitable work is geared towards children and youth, as evidenced by the fact that he was named "Man of the Year" by the Duval County public school system a few years ago. In addition, Chester has served on the board of the Alexander-Tharpe Fund (A-T Fund), which provides scholarships for Georgia Tech student athletes and the National Advisory Board at Georgia Tech. In Jacksonville, he has served as chairman of the Jacksonville Transportation Authority. He says his "greatest accomplishment for the city of Jacksonville was to push through a referendum enacting a local sales tax and abolishing tolls." He has served on the Board of Trustees for Jacksonville University, the University of North Florida Foundation and the Florida Community College of Jacksonville Foundation. He served for about 15 years on the board of Barnett Bank of Jacksonville. He was also named "Builder of the Year" by the North Florida Builders Assoc. When not working or busy with civic activities, Chester loves to be outdoors. He owns a quail hunting plantation in St. George, Georgia, on the St. Mary's River, about 35 minutes from downtown Jacksonville, where he can be found throughout the winter. He is an avid golfer; in fact, he currently owns Marsh Landing Country Club at Ponte Vedra Beach. Chester truly enjoys life and is enthusiastic about every thing he does whether its spending time on the golf course with his son; fishing from his boat; hunting on his ranch; or high atop one of his magnificent horses. Chester is married to Lynda, who is also from his hometown of Blakely, Georgia. They have a 15-year-old son, Chet. President Woodrow Wilson had just been narrowly re-elected and was in his second term as President of the United States when William Taylor Sams '37 (Gamma Alpha #518) was born on December 6, 1918. To appreciate the historical significance, World War I was winding down, prohibition had been ratified, women had still not been granted the right to vote, a loaf of bread was 8 cents, a quart of milk was 12 cents, the average annual salary for workers in the U. S. was $1,300 a year and Babe Ruth was a pitcher with the Boston Red Sox before being traded to the New York Yankees. Born in Gainesville, Florida, Taylor moved at an early age to New Smyrna Beach, Florida and then moved back to live with his Grandmother in Gainesville, Florida where he was raised. He remembers his high school days in Monticello, Florida and says, "There were entirely too many Billy's at the time... so they called me Taylor. I believe I was the only one named Taylor..."
The country was making the transition from the wire telegraph to the radio, and Taylor remembers when he was 7 years old listening to the first live broadcast of President Calvin Coolidge's inauguration in 1925. "That was a big deal in those days as everyone huddled around the radio... even when the reception was bad. I still remember listening to 'The Cisco Kid' and 'Captain Midnight' back then..." Taylor also remembers the first talking movie 'The Jazz Singer' which was released in 1927, the Stock Market crash of 1929 and everyone's favorite cartoon character was Mickey Mouse in Steamboat Willie. As the 1920s was the decade of entertainment, the decade of the 1930s was best remembered by the collapse of the stock market and the ensuing Great Depression. It is in this environment that Taylor applied to college. "The opportunity to go to college... particularly a quality school like The Georgia School of Technology, as Georgia Tech was called back then, was a dream come true," recalls Taylor. In 1936 he was accepted and made the long trip to the big city of Atlanta to enroll as a co-op student and an Electrical Engineering major. The school's name was officially changed to The Georgia Institute of Technology in 1948 to reflect a growing focus on advanced technological and scientific research. before the Tech players tackled him on the 3 yard line. Georgia Tech barely won (8-7). I also remember we had to wear our Rat Caps up until the freshman game versus the University of Georgia on Thanksgiving Day. I'm sure glad we won my freshman year." Bottling Company. They made 4 cents an hour... that was good money. Even back then Sigma Nu was one of the best fraternities on campus..." While at Tech, Taylor was active in a variety of campus activities and is one of the founding members of Omicron Delta Kappa at Georgia Tech. ODK is a national leadership fraternity requiring the highest academic and leadership standards. encouraging scholarship and intellectual development. Upon graduation in 1941, Commander Sams was called into service for WWII. After ROTC training at Aberdeen Proving Grounds, he was shipped to New Caledonia. During WWII, U.S. and Allied Forces built a major position in New Caledonia to combat the advance of Japan in South-East Asia. The proximity of the territory with the South Pacific permitted quick repairs on damaged U.S. ships. After his service, Taylor moved to Jacksonville, started working for Westinghouse Electric and then started his own small electric company which has grown into Southern Electric Company. He is still married to his beautiful wife of over 50 years, Patricia, and until recently enjoyed his boat and fishing. hosted by Brothers Chester Stokes '62 - Gamma Alpha #1137, and Hawley Smith - Gamma Alpha #1191, after the ACC Championship game versus Wake Forest in the Gator Bowl in 2006. "I will always love Georgia Tech and my days in college... and I will always love Sigma Nu Fraternity and the band of brotherhood that we shared. 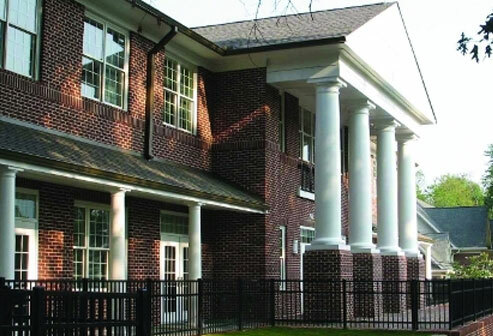 Unfortunately, there are not too many of us still around..." When asked about the new fraternity house, Taylor commented, "I have seen the pictures of the new house and it truly is grand, all of the Brothers should be very proud."